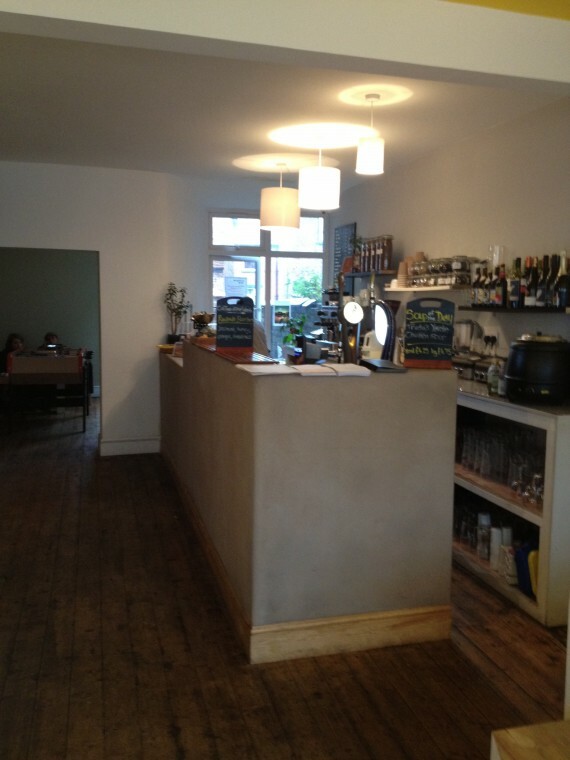 There’s nothing like popping out, on a rainy Sunday afternoon with with no plans further than getting some food and drink, so imagine how pleased we were when we also discovered Chorlton’s newest tea house with beer benefits The Spoon Inn. Only open for 4 months, The Spoon Inn with its homely bare wood floors juxtapose with the sunshine yellow ceiling has perfectly balanced a mix of simple, clean lines with tangible finishes to encase their caveat of the Chorltonian ethos, home-cooked food. The most striking element, and focus of the modest glass fronted cafe, is the rendered L-shaped bar, with its soft edged, seamless finish. When your hand first grazes the tactile surface, you cannot help but feel awakened and simultaneously grounded by the friction. Not only captivated, but impressed by its economical use of material. 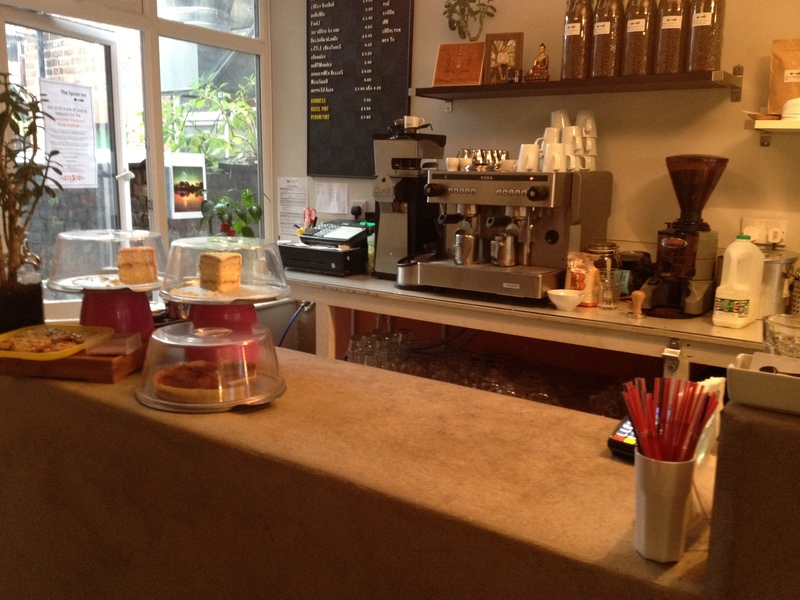 The only embellishment on the bar was the display beautiful home-made cakes and pie. The open rear display shelves offer a selection of ‘specialist’ teas, which all tea should be and which are served with respect on plain wooden caddies. All-in-all, a very unpretentious display which gives the feeling of an extension to their philosophy as with out the luxury of space and in this case a kitchen, all the food is prepared and cooked honestly and openly, at the bar. The frugal use of two panini machines on the back bar offer up satisfying aromas to it’s seated customers as the sweet peppers are griddled. Despite my first impressions of the bar area there are some operational issues which could be easily solved with minimal disruption and cost. The wooden slatted drip trays on the bar, although tasteful, are precariously placed and do slide around when glasses are placed upon them, some simple rubber grips on the bases should solve this and remain invisible. I would also add an area behind the raised bar section with a more food-prep-friendly work surface, this would not detract from the aesthetics of the bar and would offer an easier to use and clean area for the staff and food prep. The Spoon Inn Cake Offering is all Home Made. 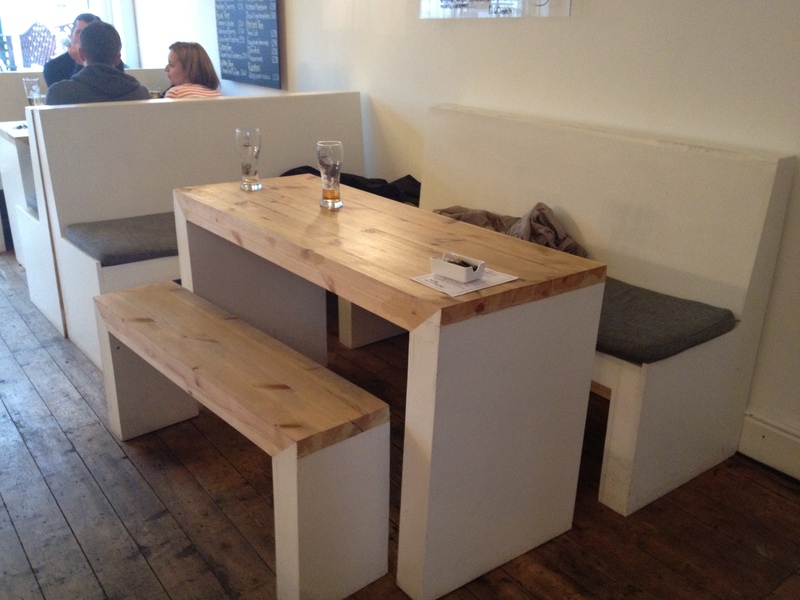 The seating area uses a selection of simple bench seating which, as far as I can tell has been made bespoke. Although there are areas where the full potential of space is not utilised, it is forgiveable as the loose bench seating gives the impression of luxury fixed seating, without the confines, giving this space ultimate flexibility. 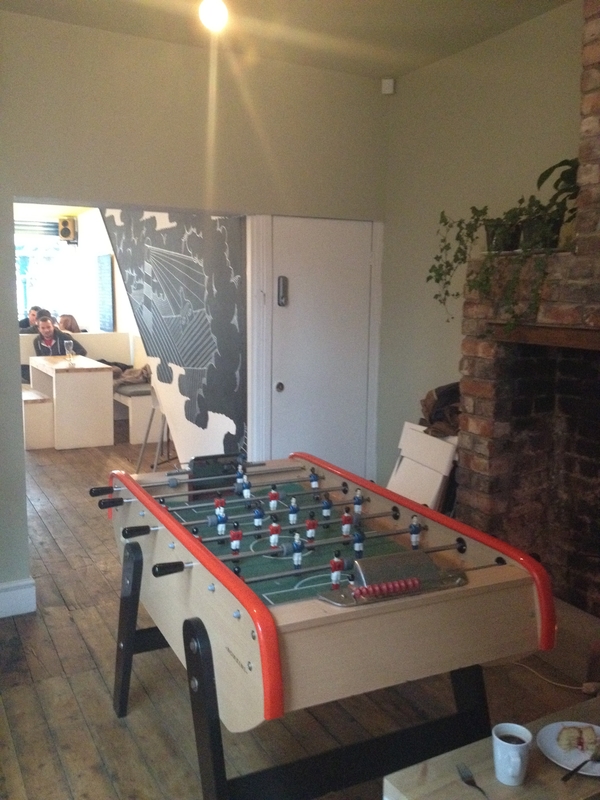 The flawless wall opposite the bar is adorned with a single, crisp black and white graphic and leads through to the unexpected, exposed brick confines of the back room which, completes the ‘at home’ feel by containing the teenage dream of a lone sofa and foosball table. But it’s not all about food and interiors here, there is plenty of entertainment on offer too with live music, poetry readings and displays from local artists. If you don’t get a chance to sample the food at their Home-cooked Pop-up restaurant on 4th October at the Manchester Food & Drinks Festival this is definitely the place to fall into if you go for a Sunday bimble, or anytime really. This entry was posted on Thursday 4th October 2012 at 3:55 pm and is filed under Construction industry, Design, Foodservice design. Glad I didn’t disappoint! It’s about time somewhere evoked a blog post out of me.